Weekly Market Analysis: January 25th to 29th 2016 - Find the best Binary Options Brokers, Binary Options Bonuses, Binary Options Signals, Binary Options Software and everything Binary Options related on Binary Options Directory! 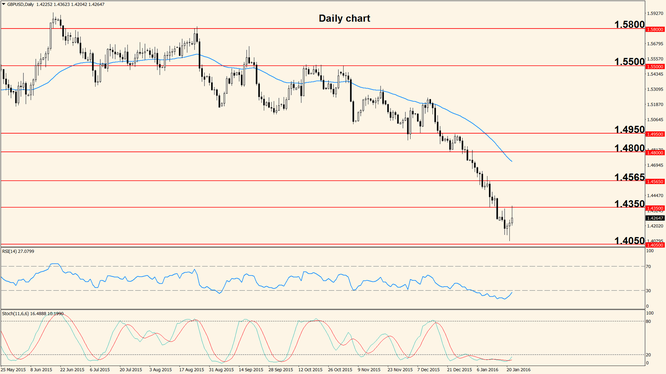 Weekly Analysis: Last week we saw an almost perfect bounce lower once resistance was touched but also some mixed movement generated by the speech of ECB President Mario Draghi during the press conference. He warned that monetary policy may be adjusted in March and this triggered a move into key support. The support at 1.0800 is a major medium term hurdle that needs to be broken if the pair is going to continue south. After the huge daily candle (early December 2015) that initially broke this level to the upside, the bulls failed to continue the move and the pair entered a ranging period which can come to an end if 1.0800 is broken to the downside. Price bounced at 1.0710 so this is an important level too, but the pair seems to react to 1.0800 much better so we consider this a more important level and if it’s broken, we expect a move towards the low at 1.0525. The week opens Monday with the release of the German IFO Business Climate, which is a highly respected survey due to its large sample size of about 7,000 businesses. Representatives of surveyed businesses are asked to give their opinion about current economic conditions as well as an outlook for the next 6 months. Usually, higher than expected numbers are beneficial for the Euro. Tuesday’s highlight is the United States Consumer Confidence survey and Wednesday the FOMC will release the Rate Statement which also contains their decision on the interest rate. No change is expected for the rate but the document may contain clues about the pace of future hikes and if this is the case, the US Dollar will respond with increased volatility. Thursday we have the German Preliminary Consumer Price Index, which is the main gauge of inflation in Germany and the same day the U.S. Durable Goods Orders (goods with a life expectancy of at least 3 years) are released. Higher than expected values for any of the 2 indicators can strengthen the respective currency although the impact is often mild. The last important event of the week for the US Dollar is the U.S. Advance Gross Domestic Product, scheduled Friday. Out of the three versions of the GDP (Advance, Preliminary and Final), this is the earliest and tends to have the highest impact, with better than expected numbers strengthening the greenback. The same day the Eurozone Flash Estimate CPI is released, offering insights into the state of inflation throughout the Euro region. 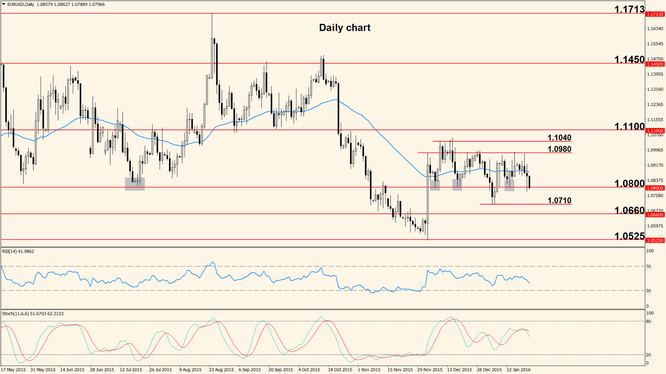 The pair finally retraced higher last week and came in contact with 1.4350 resistance after establishing a new low at 1.4079, a level last touched in 2009. The overall downtrend is still strong and moves up should still be considered opportunities to enter short-side trades. The last daily candle is a pin bar (long upper wick, with small body) that touched 1.4350 resistance and this is a strong indication that price will move lower this week, probably into 1.4050 support. As mentioned before, this is a very old support (last visited in 2009) and we cannot be sure how price will react to it but considering that last week price reversed in its vicinity, we assume it still has significance for price action. This week we expect a move into the mentioned support but a break of 1.4350 would invalidate such a scenario. Only two major events will affect the Pound directly this week: Bank of England Governor Mark Carney will testify Tuesday before the Treasury Select Committee, with the topic being the Financial Stability Report. His speech and the way he answers questions can have a substantial impact on the Pound so caution is recommended. The second major event of the week is the release of the British Preliminary Gross Domestic Product, scheduled Thursday. This version is the earliest and usually has the highest impact, with numbers above expectations being beneficial for the Pound. As always, the US events mentioned before will have a direct impact on the pair’s direction.